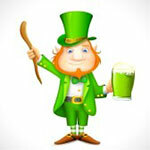 St Patrick’s Day today and I guess there’ll be a multitude of blog posts about it. As Ireland is one of my two favourite countries in the 43 I’ve visited, the other is of course Romania, I have to post something, but what? Last year I posted about a wonderful personal experience in the land of fairies. I might have seen a leprechaun on that occasion but I did have rather a lot of Guinness and Irish whisky; I’ll settle for less today. It is extraordinary how many Irish writers jump immediately to mind, way disproportionate to the size of this astoundingly beautiful country and people. I just made a list but I’m sure someone will say “what about … …?” I cannot put them, poets, dramatists, short story writers and novelists, in order of preference so I spent a minute putting them in alphabetical order. Samuel Beckett, Brendan Behan, Roddy Doyle, John Ennis, Oliver Goldsmith, Seamus Heaney, James Joyce, C. S. Lewis, Lewis MacNeice, Patrick McCabe, Iris Murdoch, Edna O’Brien, Liam O’Flaherty, George Bernard Shaw, Bram Stoker, Jonathan Swift, Oscar Wilde, W. B. Yeats. Personally I’m hard pushed to make such a list for any other nation. I could, though, make such a list for Romanian poets, they have a language which seems to me perfect for poetry. Which brings me back to writing and a post earlier today from one of the first bloggers I followed, Romanian; at the time I was struck by how good his written English was and found his writing on writing interesting, which was unusual for me as much as I like to write, reading about writing rarely interests me. When writing for children I write ‘inspired’ by children I know, so what I write is always based in truth. Those children may not always be entirely ‘real’, though they often are, but my method of writing whether for children or adults is simple: I ‘dream’ of the characters, wait for them to speak to me and write down what they say, do or think. If they don’t speak to me I don’t write, so I cannot follow the advice to write something every day. But as I write for me, with no aspirations to be published more widely than my blog, it doesn’t matter. PS. Congratulations to the Irish rugby team which beat England today to win their first Grand Slam for 9 years and the third ever.